CAUTION! use of this login by non-admins can result in ip banishment. CLICK HERE FOR CLASS REGISTRATION CONTACT INFORMATION IN ALL CITIES! Studio fees are $50.00 to $60.00 per month for one class per week. If your child wants to take tap or jazz dance she/he must also take a ballet class which now makes the fee upwards of $95.00 per month. Classes offered through City Recreation/Cultural Arts break down to around $25.00 per month and you are only required to take the class that your child chooses, nothing more. CLICK Read More..
Let's face it... your kids dont get enough quality exercise at school anymore. Joining an organized class and doing an activity that your child enjoys is a good way to get her/him moving and having fun at the same time. Some tips for finding the right activity: first ask your children what they are interested in. Remember that something they have never done might look appealing but not be what they expected when they are actually involved in it. Always complete a series of classes or a season of a sport. Never drop out midway through a course. This gives children the idea that they can just up and quit everything anytime. Follow through with your choice and then explore something new when the session is over. CLICK Read More.. If you want to subscribe to our free MailList(s), enter your email here. A confirmation email will be sent to you containing the link to use to complete your subscription. You can also unsubscribe here too. We have caught 3347 shameful hackers. 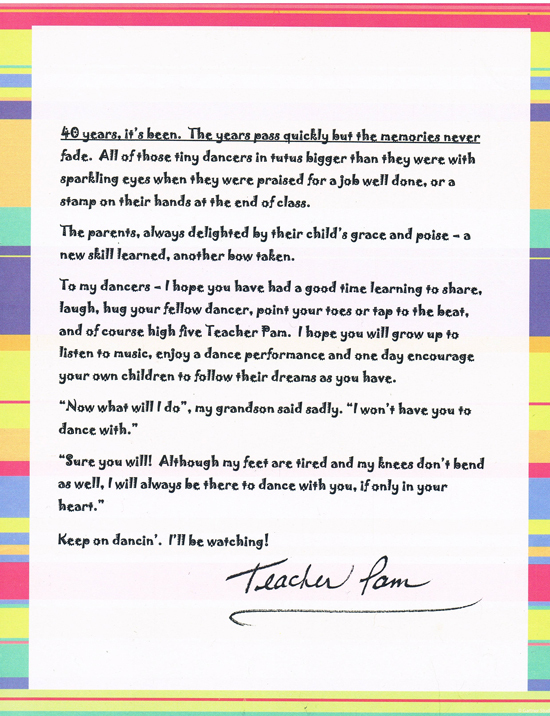 What would you like to see more of on Dancinwithpam.com? All logos, trademarks and content in this site are property of their respective owner. The comments are property of their posters, all the rest © 2005-2013 by Pam Cohen. Any reproduction of this website or companies content is strictly prohibited by law and will be enforced.